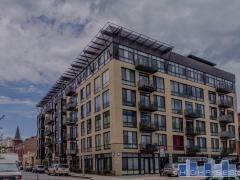 NorthPoint is a newer high-rise condominium complex in Cambridge, MA. These modern residences boast European designer kitchens, granite counters, stainless appliances, bamboo floors and walls of glass to take in the views. Indoor garage parking is available. NorthPoint is close to a Green Line T station and shuttle bus. Have any comments or questions about NorthPoint? Ask your question and/or share your thoughts about this Building.